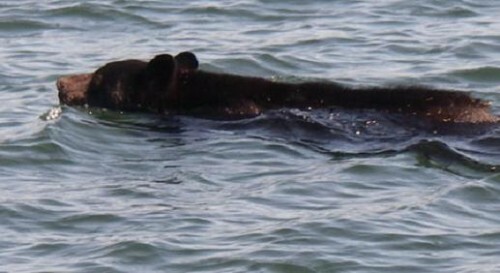 If this was a picture from the spring there would not be much more than the bear’s head out of the water. As the season progresses and the bears put on more fat more of their back appears. Our viewing area is comprised of many islands so it is not unusual to find bears moving between islands. 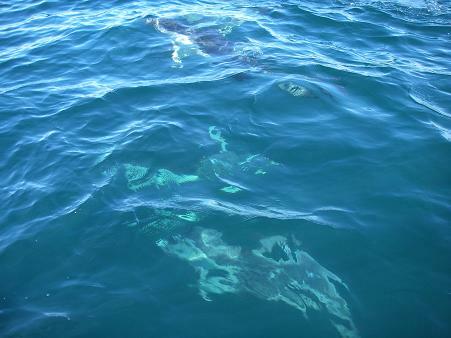 The June 8th posting showed our boats with a pod of pacific whitesided dolphins playing in the bow wake and the prop-wash. If you stop the boat the dolphins often stop with you and come along side the boat and that is what this picture shows. Two dolphins less than one meter (yard) from the boat.